There's an analogy I've been using for a while when talking about company restructures; painting the changing rooms. It's a reference to football management. When a new manager arrives at a failing team, if he's going to be successful in turning things round, then invariably the small things get done early. The changing rooms get a lick of paint, the showers are re-tiled and the training ground is spruced up. My own team, Exeter City (stop laughing at the back,) might be small but have recently won back to back promotions, coming after a period of serious failure. I put a lot of that down to behind the scenes work. Yes the manager is a good tactician, but the players will play for him because at the same time and for the first time in a while, the club is living up to their side of the bargain. Not a lot of money has been spent, because there isn't any, but the facilities look better than they have in a long time. It's a signal to the players from the management that things have changed, and it gives the new manager a contract with his players. He'll give them the best training environment he can and in return, they'll train hard, turn up on time, stay off the beers and eat properly. Just turning up and saying 'things are different' doesn't work. It might buy you a few weeks, but very quickly, people start to realise that they're not different at all and go back to failing. Marketing agencies are going through an upheaval. The margins from traditional planning and buying have been eroded and it's become a commodity, so agencies are trying to change. New media, new income from research and new fees for consulting. How are we going to signal the change? Agency staff are taking on new roles and agencies are trying to recruit in new places. We're asking our people to overhaul what they do, so what's the other side of the contract? I think it's time for an overhaul of the little things. A statement of intent. Media planning is tired and it looks tired. If you're sat in an agency, take a look around. If you're in a creative agency, maybe skip this bit, but if you're in planning, what's your office like? Bit scruffy? Lots of paper strewn about? Struggling for space? Thought so. It's not right for everybody, but the contrast with a traditional media agency is stark. And Google, in many ways, are the competition. 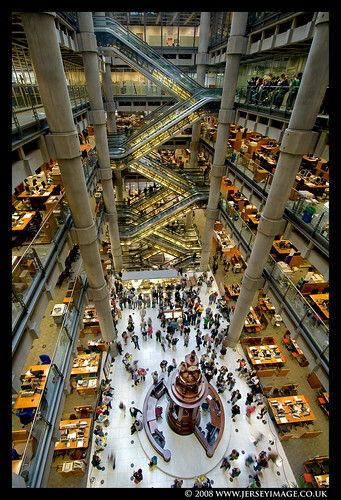 On the London Open House day, I went to visit Lloyds of London. Their office is stunning. I'm not suggesting a marketing agency should ever have an office just like this and I wouldn't want to work in one that did, but if I worked at Google or Lloyds, I'd feel like the company believed in what they were doing. That they had a vision and they were seeing it through. This is what the competition look like in the new world. Finance looks like Lloyds. New media looks like Google. Old media looks scruffy. The companies that are already good at the things we want to do, don't look like media agencies. I we want to avoid being commoditised, to be taken seriously as consultants and to take on competitors beyond other media agencies, then just saying so isn't enough. It starts with the little things. We don't need an office like Google's yet, but de-cluttering the one we've got would be a good start. We don't need Bloomberg Terminals, but we need decent IT kit*. We don't need the Lloyds building, but we just can't stick junior planners in the corner for six months until we find something better. Want to change the media world? It starts with painting the changing rooms. *Seriously, I've had a 14" monitor for four years. If you buy a PC in the shops, you have to ask specially to get anything under 17". I was in Barclays on High Street Kensington the other day. Design is incredible. It's like being in the internet. Web 2.0 colours. Big banners with simple text and gradients. Open tills with no glass. Lots of white space between elements. A greeter who makes sure you're looked after. This, I thought to myself, is a business looking at a future after the crunch. Nearby Lloyds is as grotty as ever. Incidentally, Lloyds took state money and I believe Barclays didn't. Coincidence?